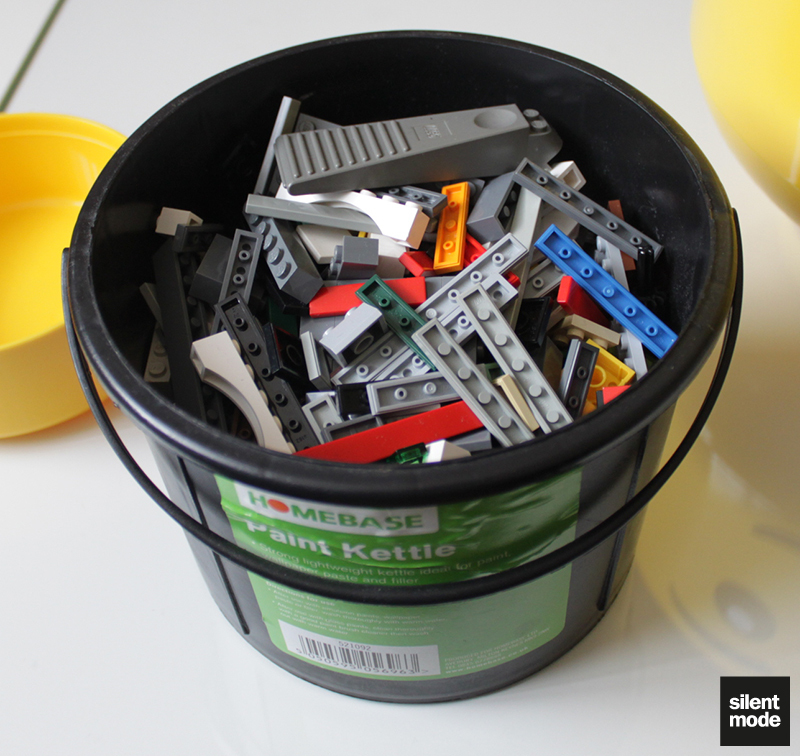 I have a rather large collection of parts, all mixed up, and I wanted some way of making sorting a lot easier. 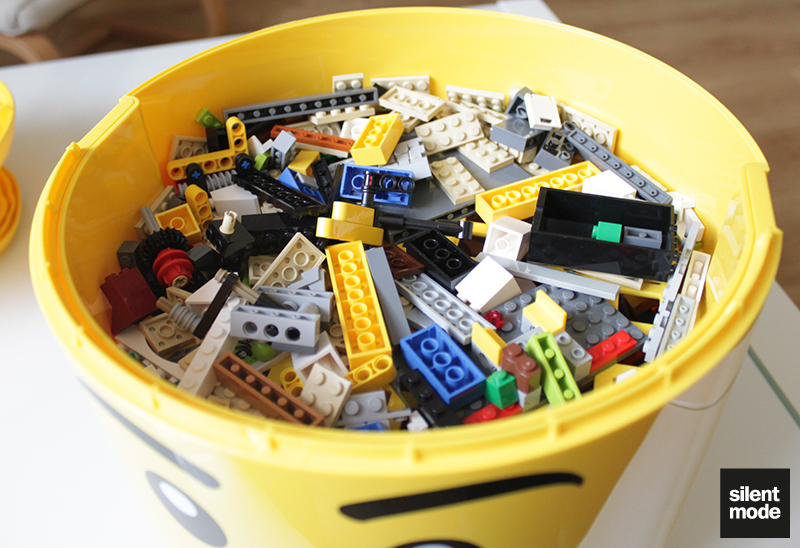 It’s somewhat therapeutic – but absolutely no fun – spending hours sorting the small parts from slightly larger ones. 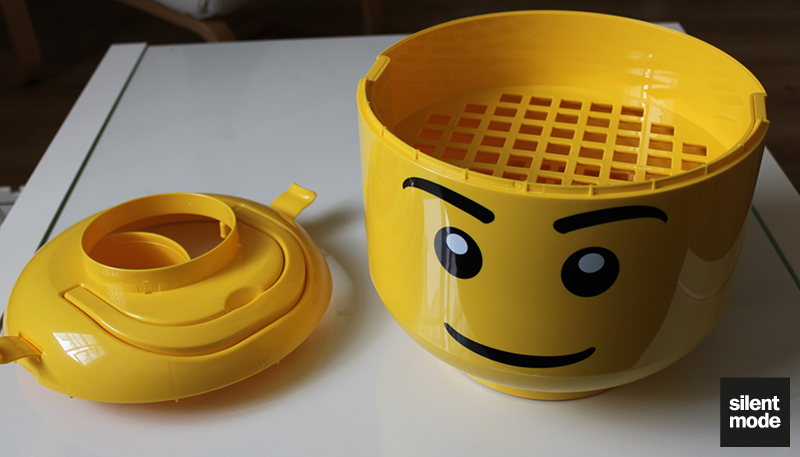 I bought this Sort and Store – a storage item that also “sorts” Lego parts into big, medium-sized and small parts – to see if it would be of any help. 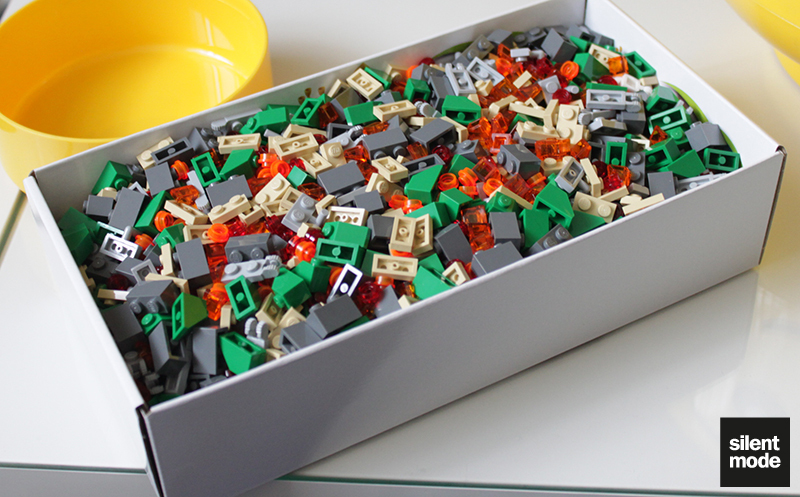 From the outset I wouldn’t have expected it to do any colour sorting, but I thought it might be useful for separating all those studs from tiles, for example. 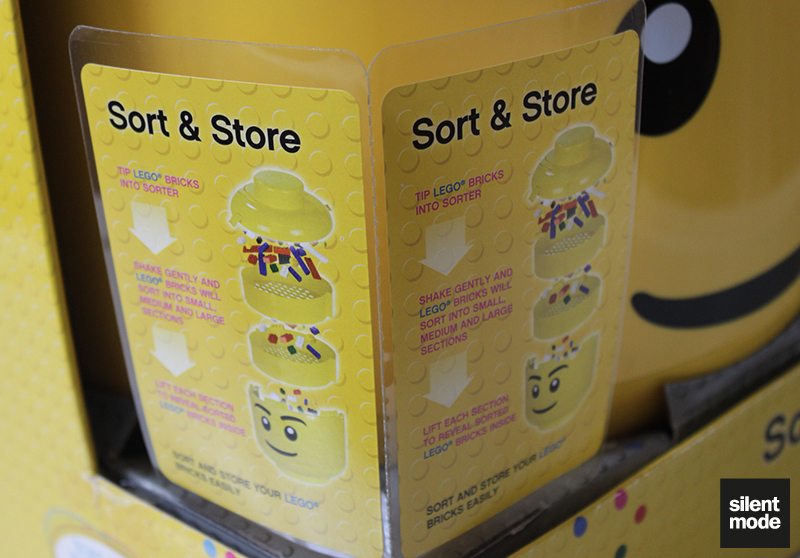 Although the Sort and Store is listed on the US Lego shop site, it isn’t on the UK site, nor have I ever seen it in a Lego store over here. The only place I know that sells them is John Lewis. 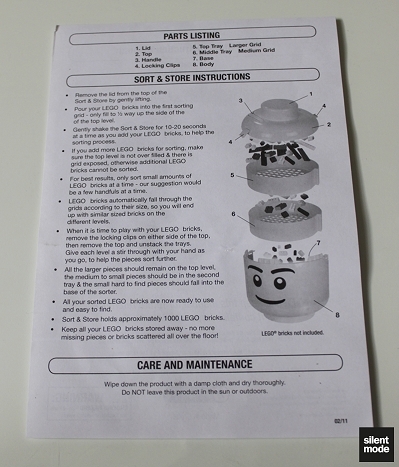 The plastic corner insert at the front basically has the same info on it. 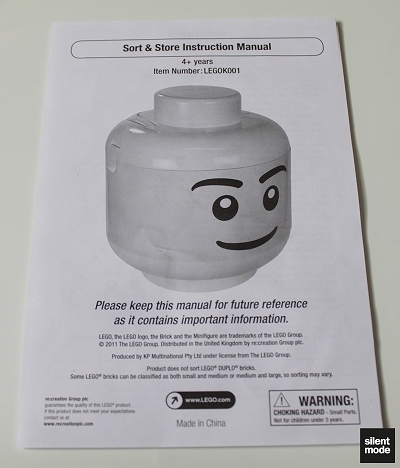 Inside the box is a basic instruction pamphlet describing how to use this contraption. This thing is HUGE. 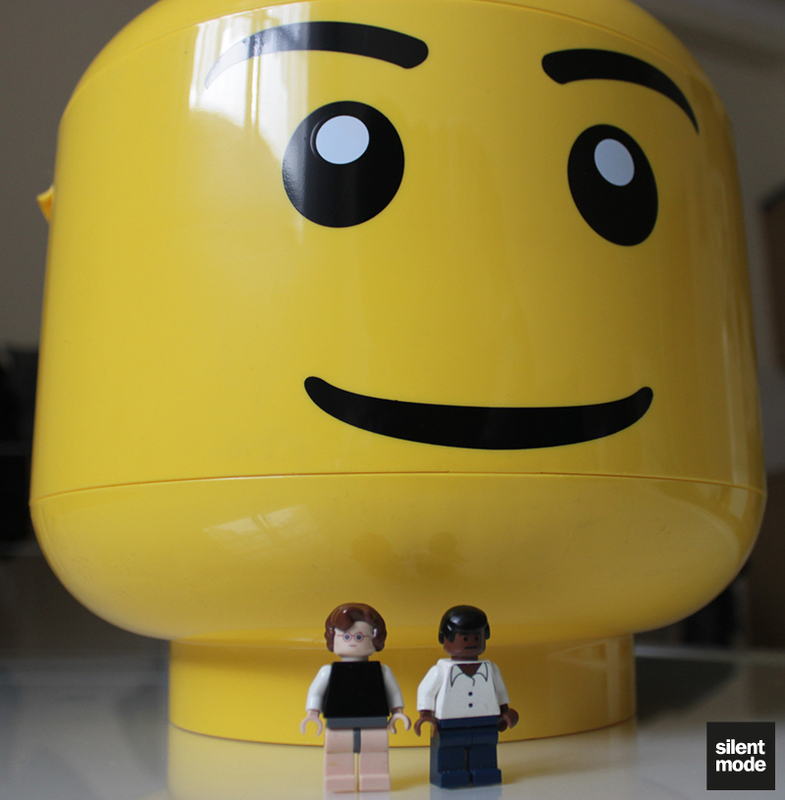 To give a general impression of how big this thing is, I’ve asked a couple of volunteers to stand next to it. I guess it stands to reason that it’s large, especially if it’s going to house and sort a large number of parts. 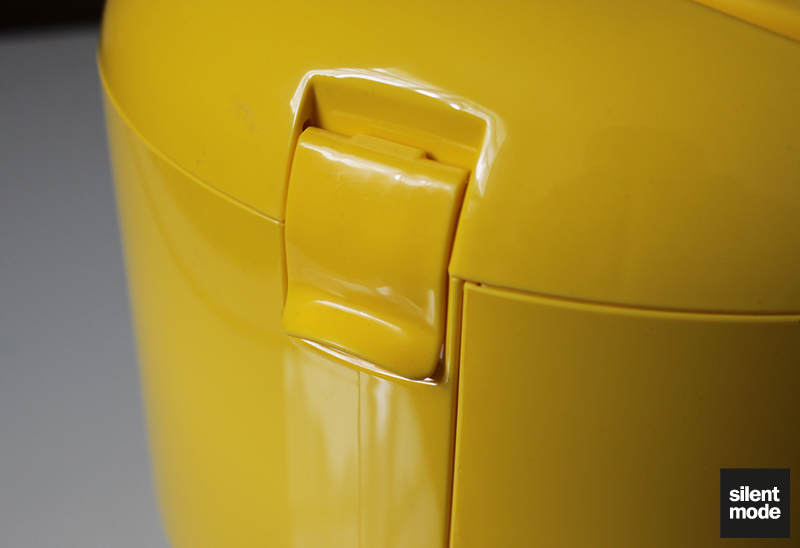 The head has a carry handle, but I find it hard to lift because of the small indent. 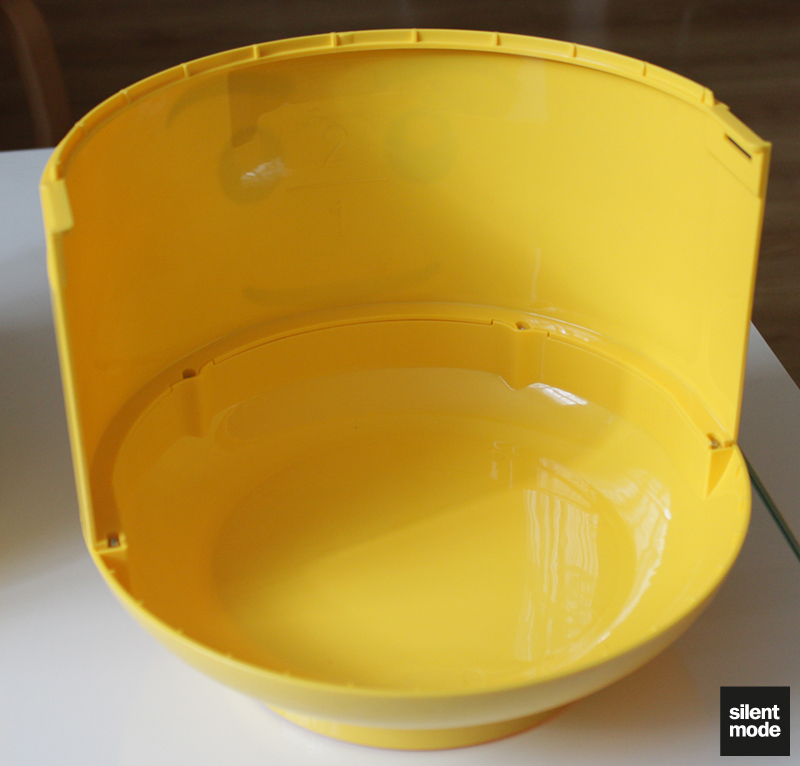 Both sides of the head have clamps for keeping everything intact. 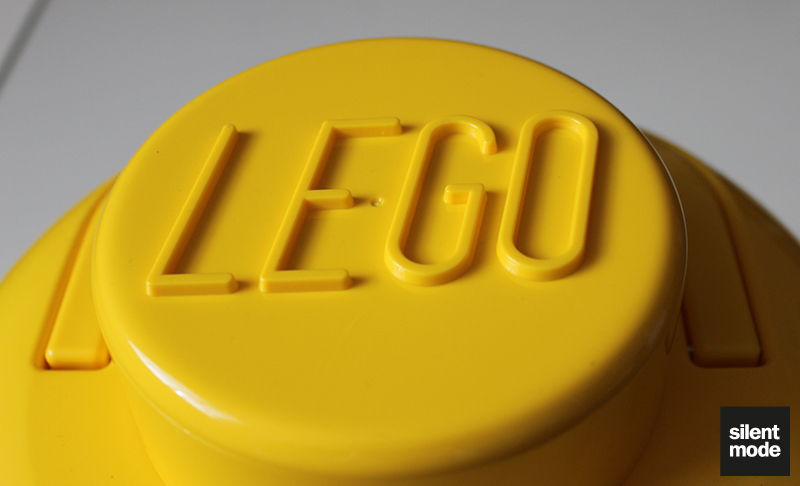 But seriously: the stud eventually lifts to reveal an opening in the head, with which you fill the Sort and Store with your various bricks and things. 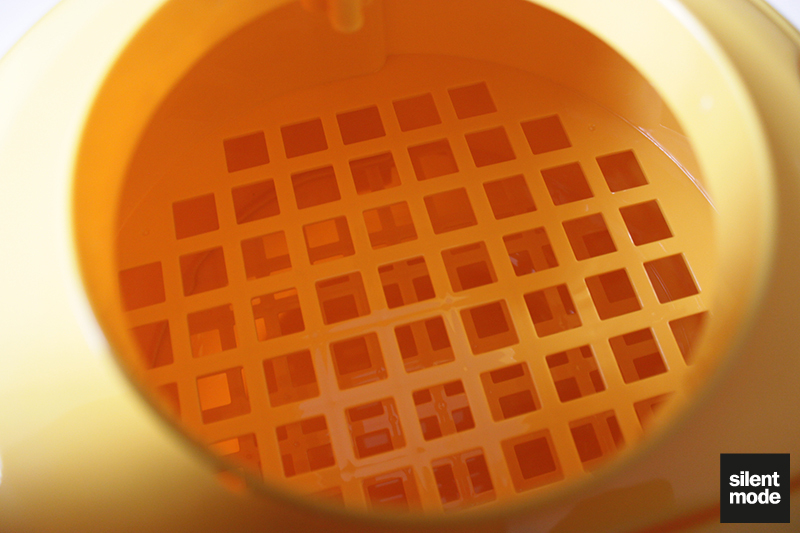 A little peek inside the head shows there are no brains to speak of, but a series of lattices to do the sorting. To save a bit of time I’ve separated all the parts that make up the Sort and Store, all displayed here: two sorting trays with lattices make up the back of the head, with the rest of the head catching the tinier parts. Here’s the back of the head without the sorting trays. 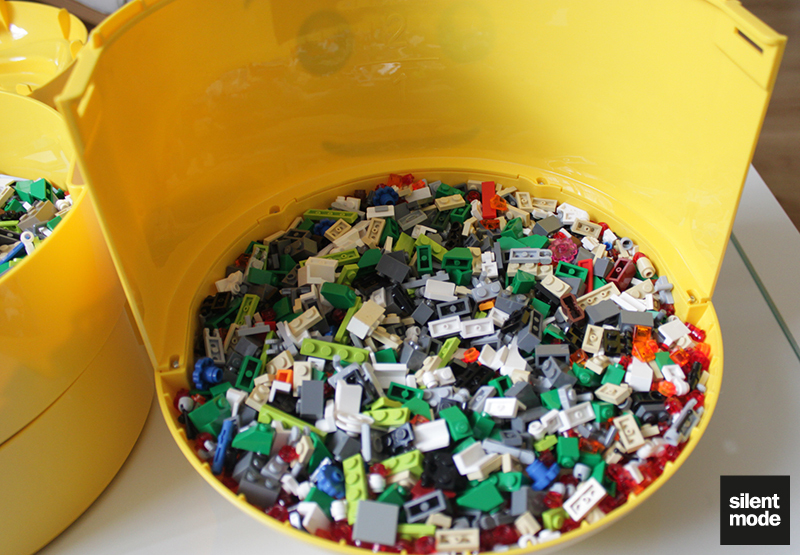 To test the sorting capabilities of the Sort and Store, I filled it with the contents of three different containers of random parts. 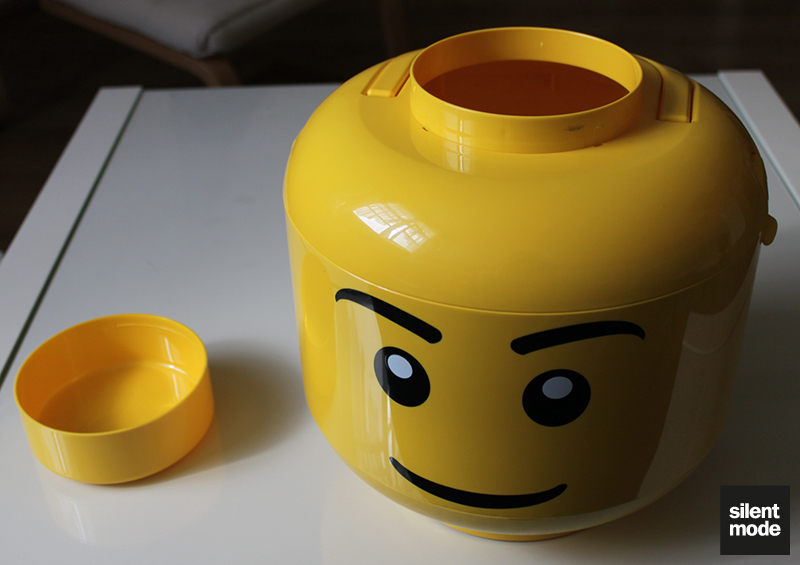 ^ The first container mostly comprised of items from various Bricklink orders that people were generous enough to trade with me. 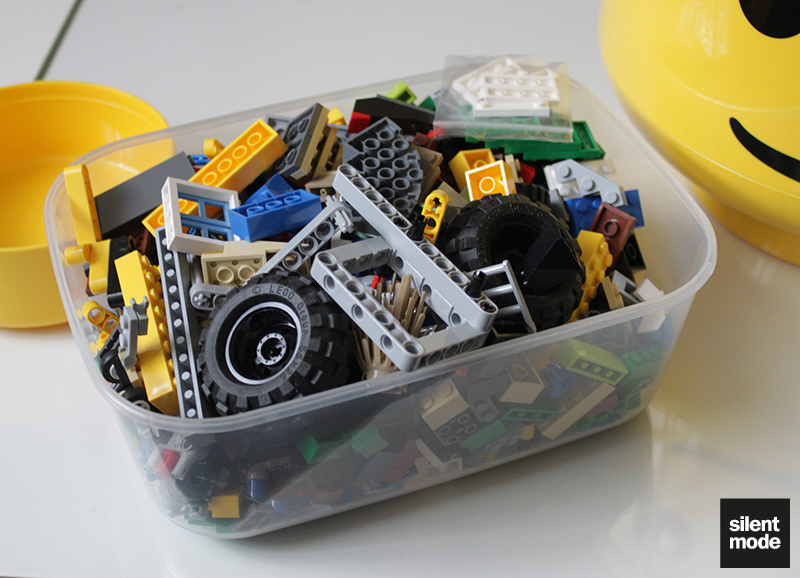 ^ The second contained a bunch of parts obtained from grab bags at the Westfield (Shepherd’s Bush) Lego store. I was particularly lucky this month as the bags contained a number of useful and unusual elements, including from Alien Conquest and the Fallingwater set. 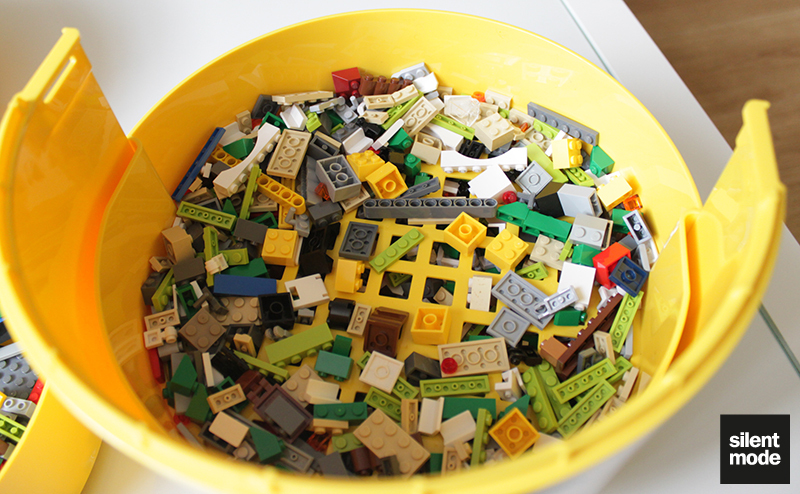 ^ The third was a random assortment of small parts, all obtained from the PAB wall at Liverpool One’s Lego store. So after inserting the contents into the Sort and Store, and giving the whole thing a good shake for several seconds, here’s what happened. 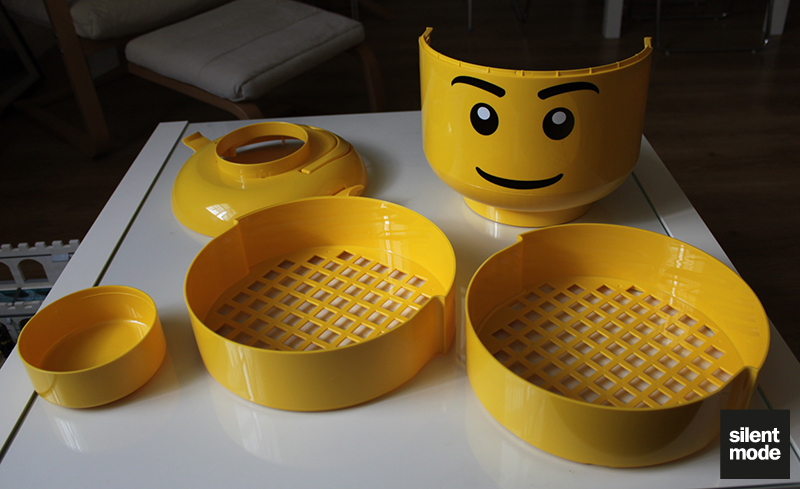 The top tray managed to retain the larger pieces (which, given the size of the holes, was no surprise), and a few of the wider elements. You can also see some small elements that got trapped next to or inside some large ones. The middle tray was where things got a little concerning. Some of the 2×4 plates and 2×2 bricks made it through to here, but this tray didn’t seem to hold much at all! 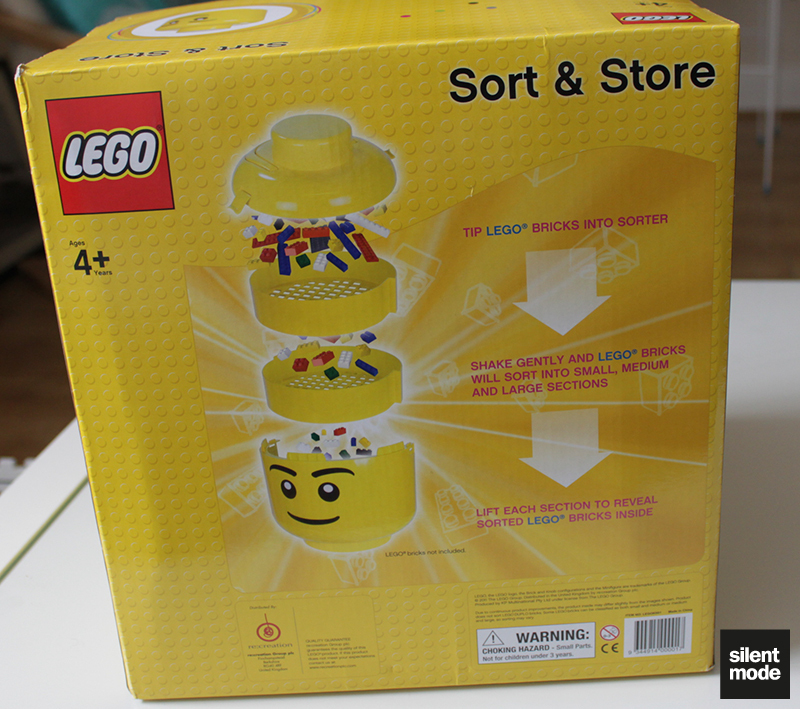 And the bottom of the Sort and Store was basically full; quite a few elements, including some 1×3 bricks and the flower brick, were ones I didn’t expect to find there. This is obviously aimed at kids, who probably wouldn’t have nearly as many elements as an AFOL in their collection. 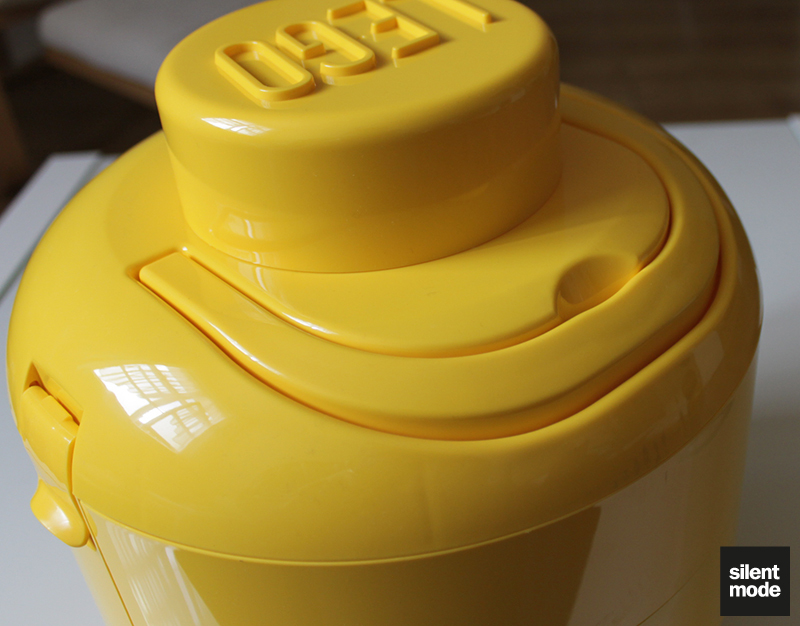 It’s a big enough container to be effectively used as a storage solution, and it’s a great novelty item. As a sorting solution it’s let down by the holes in the middle tray being a bit too big, as well as (in this case) not enough space at the bottom for the parts that do get down there. 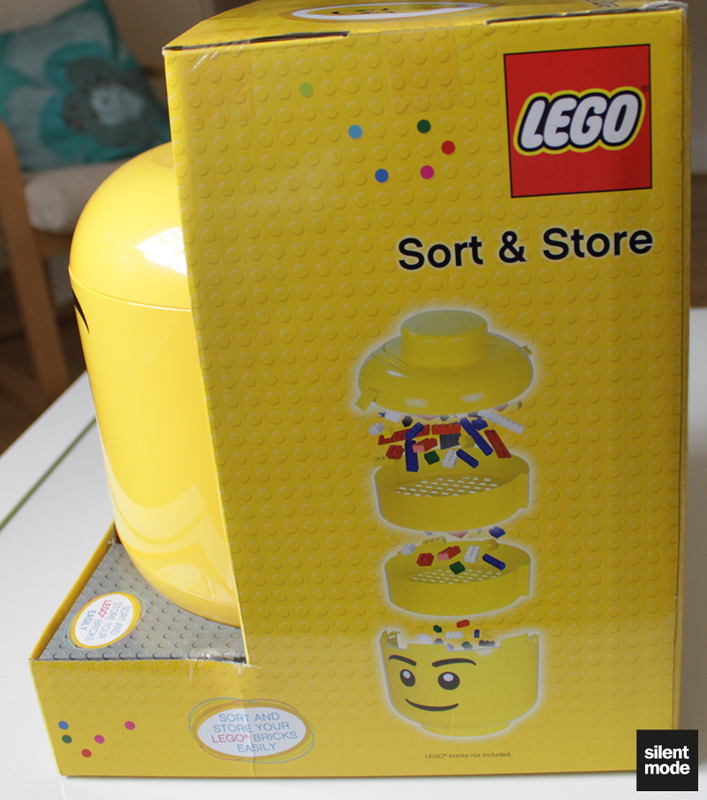 One thing that would have helped make this an easier purchase is the inclusion of parts: perhaps a minifigure or just a handful of bricks to test the sorting with. 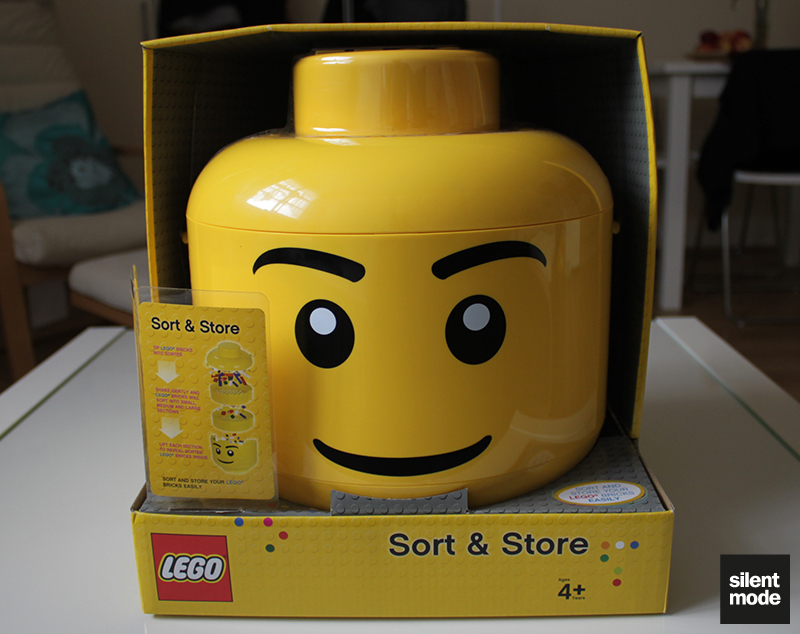 As it stands there’s no real incentive to buy one of these things, other than as a fancy Lego-themed toy box to show one’s friends just how much into Lego they are – especially at the RRP. If I had to give some kind of score out of thin air, I’d say it’s worth 4.0/10.